They are dark rings on the ice with a diameter of 5-7 and a km width of about 1 km (Fig. 1). In the ring center and outside the ice is thick and white, in the ring itself it is dark and thinner. Rings appear in an unpredictable manner, in different places and in different years. Fig. 1. 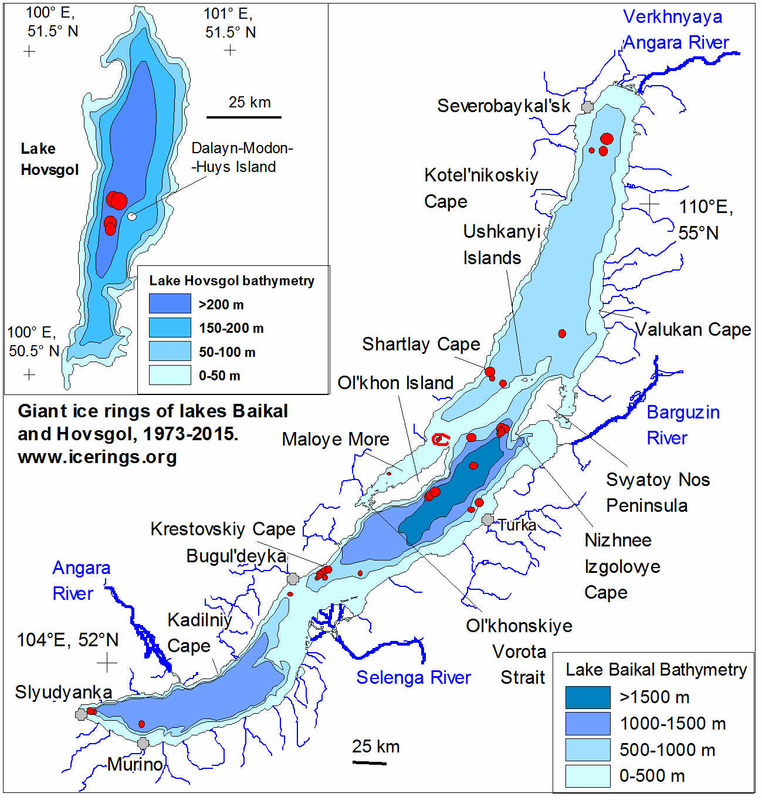 Examples of ice rings for lakes Baikal and Hovsgol. Images from Landsat 1-7 (а, c, g-i), MODIS/Terra (d-f) and ISS (b). All images, except (е) are oriented northward. Location and parameters of ice rings are on Fig. 2 and Table 1. How can one observe ice rings? Rings are too big to observe them from the ice or from the shore. But they can easily be seen from above - from an airplane or (even better) from a satellite. Where can one observe ice rings? The existing articles and internet publications discuss only the ice rings in Lake Baikal. 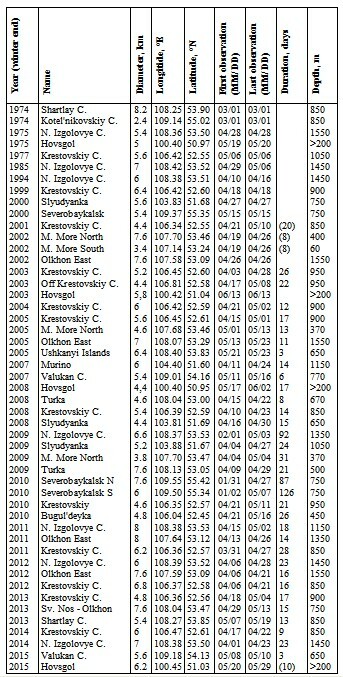 By analysing satellite imagery for 1974-2015 we have detected 45 rings for Lake Baikal (as compared to 13 previously known) and, for the first time, 4 ice rings on the neighbouring Lake Hovsgol in Mongolia (Table 1, Fig 1). They probably exist in other lakes too, but have net yet been discovered. Table 1. Ice rings inventory and their parameters. Is it a recent phenomenon? Since the advent of MODIS imagery (twice per day) at the end of 2002 it has become easier to observe ice rings. But ice rings are not a recent phenomenon - we have detected ice rings on Landsat images as early as the beginning of the 1970s. Where and when do ice rings appear? Usually they are observed in the second part of April (Table 1, Fig. 3), but they have appeared earlier (31 January) and later (26 May). They often appear near Capes Krestovskiy and Nizhneye Izgolovye in Lake Baikal and near Dalayn-Modon-Huys island in Lake Hovsgol. But in Baikal they have been observed in many other places (Fig. 2). Fig 3. 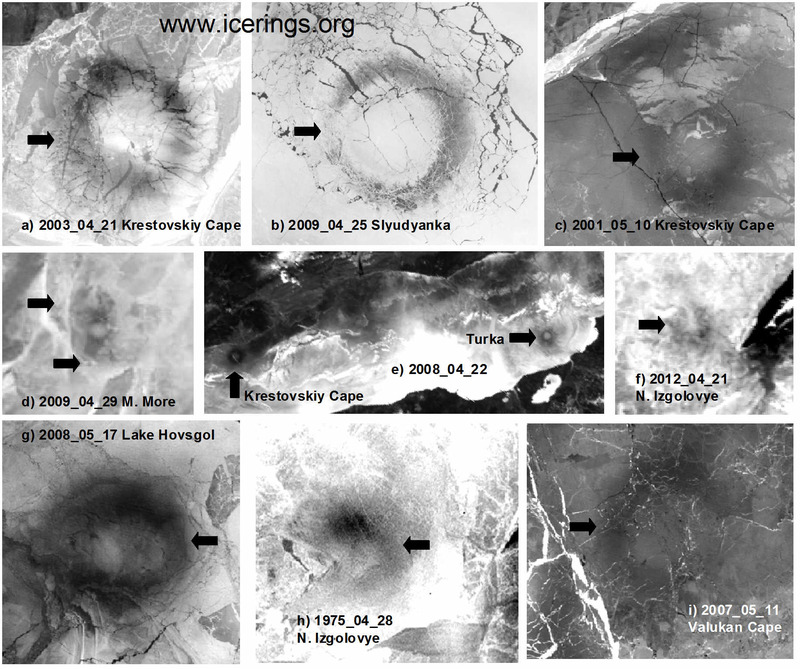 Appearance (31 January) and development of the ice ring near the Nizhneye Izgolovye Cape in 2009. There are many hypotheses - from atmospheric influence, to biological activity in the upper water layer to UFO and hoaxes (crop circles etc.). Many hypotheses relate ice rings to methane escaping from the bottom sediments and gas hydrates. However, detection of ice rings in regions with small depth or without known gas emission sources rule out gas release as a universal explanation of ice ring formation. If it is not methane, then what is the reason? Results of our field surveys show (Fig. 4) that before and during ice ring manifestation there are warm anticyclonic (clockwise) eddies under the ice cover. They have a lens-like (double-convex) form. Water from the eddy center (40-45 m depth) goes upwards and downwards. How exactly do eddies lead to ice ring formation? In the eddy center currents are weak, and although there is warmer water under the ice, the ice does not melt. But on the eddy boundary, currents are strong (Fig. 5) and warmer water leads to rapid ice melting. First ice needles are formed on the lower ice boundary, then ice breaks, and steamthroughs, leads and large areas with open water appear. Giant ice rings are surface manifestation of eddies activity under the ice. Fig. 5. Ice ring near the Nizhneye Izgolovye Cape, 3-4 April 2014. Left - needle ice crystals (10-12 cm long) from the ice lower surface. Right - current strength and direction. What is generating the eddies? This question needs further study. Among the potential mechanisms are wind influence before ice formation, seiches (oscillations of water and ice under the influence of atmospheric pressure), river input or interaction of coastal currents with coastlines, such as near the Nizhneye Izgolovye Cape (Fig. 6). It is also still not clear, whether eddies are generated before ice formation or during stable ice cover conditions. We continue to work on these issues. Fig. 6. Near the Nizhneye Izgolovye Cape anticyclonic eddies often form before ice formation. Left - warm eddy. Right - strong wind from Barguzin bay carries clouds (A) and forms an eddy, surrounded by young ice (B). How do you minimise the risk of getting into an ice ring? While cracks are relatively easy to spot, in the region of the ring, the ice has the same appearance as usual, but its thickness is much smaller (Fig. 1). 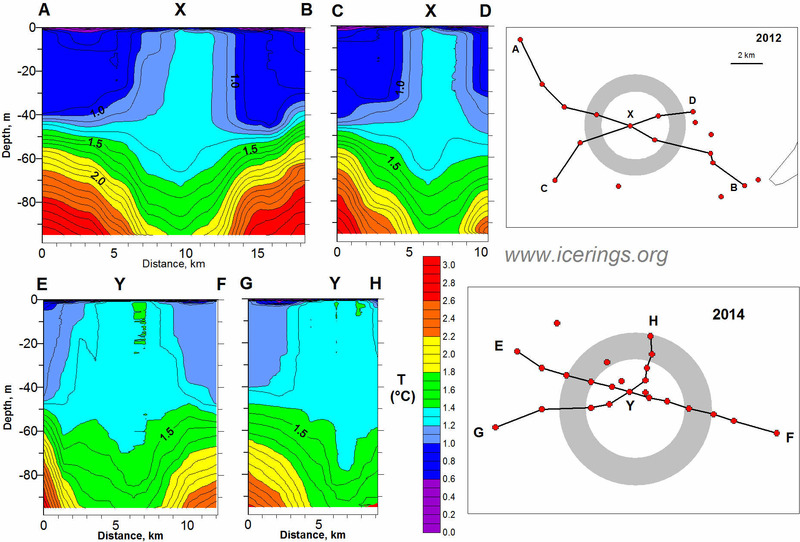 It is better to avoid regions where ice rings usually appear (Fig 8), even if the ice in other regions is solid. It is important to issue timely warnings if ice rings have been detected on satellite images. It is possible to forecast ice ring formation if a warm eddy is detected in the beginning of winter, but this requires large-scale and detailed field work. See also section "Safety" for more information. Fig. 8. Even an experianced driver may get into a difficult situation. 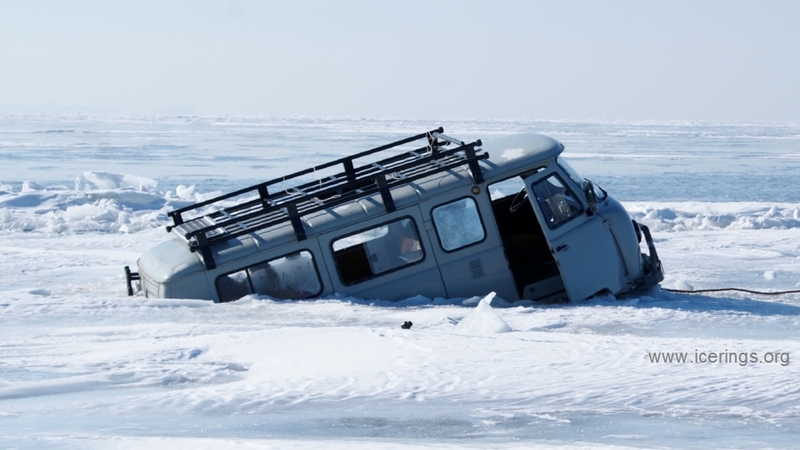 The UAZ vehicle stuck in ice in the region of the ice ring near Nizhneye Izgolovya Cape, 18 March 2016. (c) А. Beketov. I want to know more. I have information on new ice rings, and on other unusual ice phenomena. You may find more detailed information in section "Resources"
Fig. 9. A.Ya. Suknev and dog Buran perform measurements of water parameters under the ice. 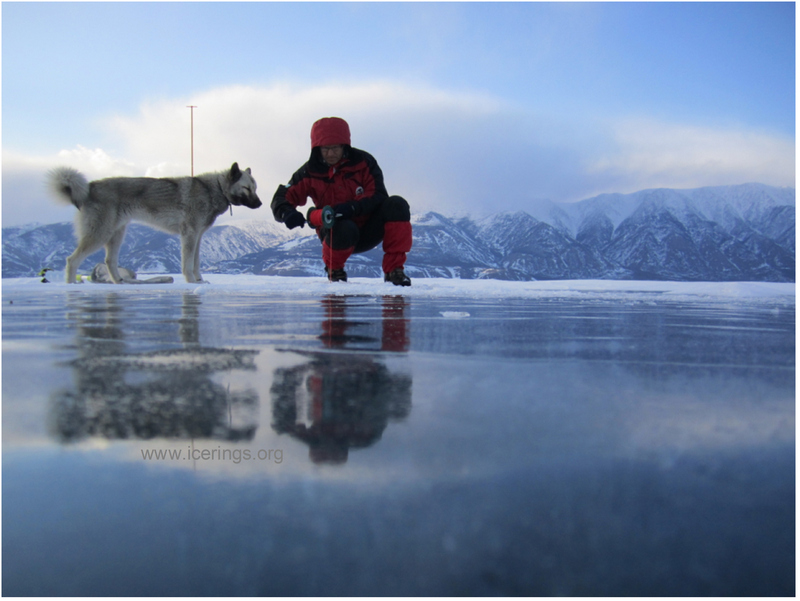 Every year since 2010 (for Lake Baikal) and 2014 (for Lake Hovsgol) we conduct field studies on the ice. We would like to thank A. Beketov (Ust'-Barguzin)? T. Tivikova (Turka), S. Sushkeev (Tunka), Hurga and Byamba (Mongolia) as well as all who helped in field and scientific work. The study was supported by ERA.NET RUS Plus S&T #226 "ERALECC", CNES TOSCA "Lakes," CNRS PICS "BaLaLaICA," RFBR 13-05-91051 and IDEX Transversalite InHERA projects.